Why is a new place so spooky?!? 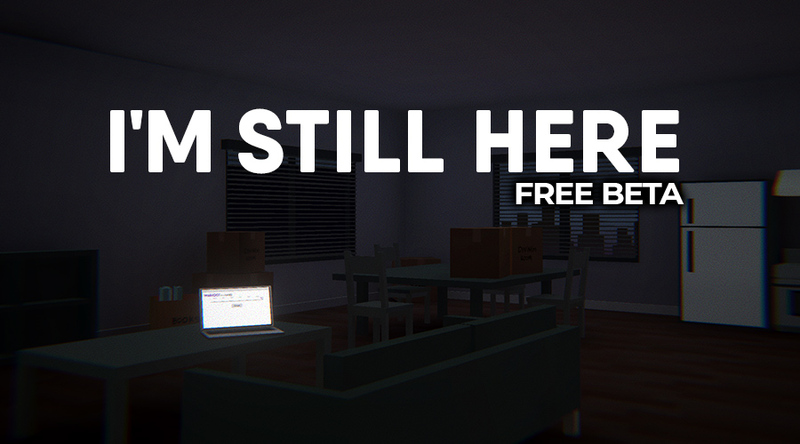 Here's my gameplay of I'm Still Here, definitely not what I expected coming in but in a good way :) its a cute short funny horror game with a surprise twist. I was hoping for a bit more than the game delivered, perhaps several stories or tasks. It was very short and I could see it definitely being the demo for a much longer and more detailed game. It was good in the concept though, it's a very used idea, moving into a haunted house, but that they made peace with the ghost was a touch I hadn't expected. I think there should have been several deaths by different ways –murder and natural causes- to add to the story and give the player more than 7 to 10 min of game play. Again game was not the best, but could be improved and I encourage the developer to make this a demo and expound on the game if they had the time. I LOVE THIS GAME. I have a video of it going up tomorrow and to anyone thinking about playing this game I can only use a quote to express my opinion "JUST DO IT!!!!!!!!!!!!!!!!!!!!!!!!!!" This game was unexpected, but really quirky and funny. Definitely worth a look. MAKE IT! DO WHAT YOU LOVE, SEND ME IT WHEN IT'S DONE PLEASE! I had a great (but short) time with this! I hope there will be an expansion on this idea at some point - it's adorable and entertaining! Awesome game! I was expecting scares but got so much more! Not quite what I expected, but that's a good thing! Very well done game that I had a blast playing! Has a bit of that creepy vibe but a lot more mixed into it once you start playing. Great game Cozy Game Pals, can't wait to see what you guys have next! They're all pretty different, but we keep them light and silly. Awesome game. The ending made me cry. Haha, you two are so cute together! Caught me off guard with this one. Pleasantly surprised. Wahoo Answers are the best, always so accurate! This game is hilarious! I absolutely loved it and can't wait to try your other games! Here's the video I made about it! This was fun! A bit buggy, but I found workarounds for what I encountered! I like how you have to google your problems to solve them XD Just like real-life. I made a let's play, as well. Hope it helps! Is there a way to lower the sensitivity? I don't know if it's my computer or the game but it's insanely high. We did not have enough time to add an options menu. It was the opposite for me, incredibly slow. *Rurr* I really enjoyed this game, at first I downloaded it thinking it was going to be an indie horror game, but was pleasantly surprised - I also wanted to ensure the thumbnail didn't have any spoilers like others did ;o I want more games like this! You move into your new apartment only to find you have an unwanted houseguest -- specifically a ghost. This ghost is not scary, merely a bit of a nuisance and is a pretty good dude once you get to know him. This games unique sense of humor really made it super enjoyable -- would pick up all my books again!! Your playthrough was a ton of fun to watch! Really enjoyed this game a lot guys!! Thank you so much for making it. I do wish it was a little longer, but it was still a lot of fun! aww jeez, you are so nice haha. It's really encouraging. We're really glad you got the game and enjoyed our style! Nice game. Wish it had been a bit longer. same here, haha. We had so many ideas but lost the time and energy to get them all in. We're still happy with how it came out though! This game was fantastic, especially for how simplistic it was. I laughed, I cried, and I recorded a video to show off the game. Looking forward to trying your other games! I loved every second of this. I really wish I could've made friends with the ghost and got a new roommate though! I liked it! Yet a very sad game XD Really cool, but wish it was longer! Here is my playthrough if anyone is interested.